In this study the effect of i.r. 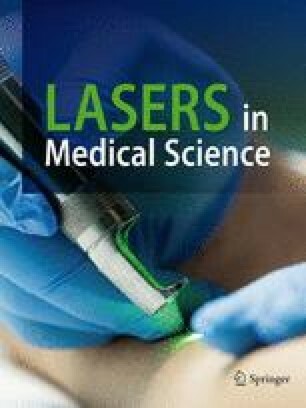 laser irradiation on the vasomotricity of the lymphatic system was investigated. In order to examine this influence we carried out microscopic observations by means of a cold light source illuminating the everted skin of mice. The lymph vessel was visualized by an injection of a physiological dye (Patent Blue V) into the inguinal lymph node. In a group of mice (N=40) where no oedema was present before the irradiation, no dilatation of the lymph vessel was seen. However, in a second group (N=40) where we produced an oedema by means of an intradermal injection of a physiological fluid we observed a remarkable vasodilatation of the vein, artery and lymph vessel.